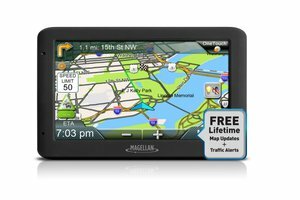 Magellan Refurbished RoadMate 5635T-LM, 5"
Free Lifetime Map updates for the life of your Magellan RoadMate navigator. The Magellan RoadMate gives you a feature rich GPS navigation experience. Enjoy the ease of a 5" high resolution touchscreen that automatically adjusts color and contract for clear day or night viewing. Drive with confidence when equipped with free lifetime map updates and traffic alerts. New features make navigation easier. 3D Buildings help to provide a more realistic view of your surroundings by displaying notable landmarks on and around your route in 3D. With the RoadMate, you'll also have portrait mode, allowing you to see more of the route ahead of you. With Landmark Guidance, your routing instructions use landmarks instead of street names, making it a more intuitive way to navigate. You'll hear instructions like "In 200 feet, turn left at the Gas Station". Then the upgraded Junction View generates realistic images of freeway signs guiding you to the correct lane to make driving easier, safer and less stressful. Personalize your travel experience with the OneTouch Favorites Menu. Easily create icons of your favorite places and searches, such as your favorite coffee shop, restaurant, gas station, or bank. Just touch the customized icons to see the nearest locations of your favorite chain destinations while within any city. Two viewing modes adapt to your personal viewing preference. Landscape mode provides an improved peripheral view of your surroundings - while Portrait mode provides an extended view of the road ahead. Large 5" display with day and night views for easy visibility.